"Pasadena Freeway" and "CA 110" redirect here. For the freeway in Texas, see Texas State Highway 225. For the entire California State Route 110, see Interstate 110 and State Route 110 (California). The Arroyo Seco Parkway, also known as the Pasadena Freeway, is the first freeway in the Western United States. It connects Los Angeles with Pasadena alongside the Arroyo Seco seasonal river. It is notable not only for being the first, mostly opened in 1940, but for representing the transitional phase between early parkways and modern freeways. It conformed to modern standards when it was built, but is now regarded as a narrow, outdated roadway. 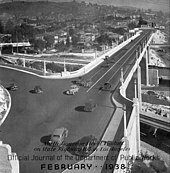 A 1953 extension brought the south end to the Four Level Interchange in downtown Los Angeles and a connection with the rest of the freeway system. The road remains largely as it was on opening day, though the plants in its median have given way to a steel guard rail, and most recently to concrete barriers, and it now carries the designation State Route 110, not historic U.S. Route 66. Between 1954 and 2010, it was officially designated the Pasadena Freeway. In 2010, as part of plans to revitalize its scenic value and improve safety, the California Department of Transportation (Caltrans) restored the original name to the roadway. 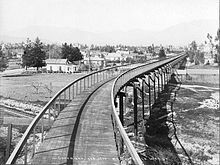 All the bridges built during parkway construction remain, as do four older bridges that crossed the Arroyo Seco before the 1930s. 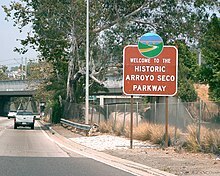 The Arroyo Seco Parkway is designated a State Scenic Highway, National Civil Engineering Landmark, and National Scenic Byway. It was listed in the National Register of Historic Places in 2011. Beginning in June 2010, the state began modifying interchange signs to remove the Pasadena Freeway name and reinstate the Arroyo Seco Parkway name. Signs that indicate route 110 as a "freeway" are being modified to "parkway" or its "Pkwy" abbreviation. Except where prefixed with a letter, postmiles were measured on the road as it was in 1964, based on the alignment that existed at the time, and do not necessarily reflect current mileage. R reflects a realignment in the route since then, M indicates a second realignment, L refers an overlap due to a correction or change, and T indicates postmiles classified as temporary (for a full list of prefixes, see the list of postmile definitions). Segments that remain unconstructed or have been relinquished to local control may be omitted. The entire route is in Los Angeles County. ^ Legal Truck Size & Weight Work Group (March 2, 2011). "Special Route Restriction History: Route 110". Sacramento: California Department of Transportation. Retrieved May 28, 2015. ^ a b c d California Department of Transportation. "State Truck Route List". Sacramento: California Department of Transportation. Archived from the original ( XLS file) on June 30, 2015. Retrieved June 30, 2015. ^ a b National Park Service (February 4, 2011). "National Register of Historic Places Weekly Action List". National Register of Historic Places. National Park Service. Retrieved July 27, 2012. ^ Gruen & Lee (1999), pp. 4–5. ^ Pool, Bob (June 25, 2010). "Pasadena Freeway getting a new look and a new name". Los Angeles Times. Retrieved July 29, 2011. ^ Gruen & Lee (1999), pp. 9, 51. ^ Gruen & Lee (1999), pp. 9–10. ^ Scheid, Ann (2006). Downtown Pasadena's Early Architecture. Images of America. Charleston, SC: Arcadia Publishing. pp. 78–79. ISBN 978-0-7385-3024-6. ^ a b Thomas, Rick R. (2007). South Pasadena. Images of America. Charleston, SC: Arcadia Publishing. pp. 60–65. ISBN 978-0-7385-4748-0. ^ "Dash into Pasadena in Twelve Minutes". Los Angeles Times. January 1, 1909. p. II1. ^ Gruen & Lee (1999), pp. 17–18, 23. ^ Gruen & Lee (1999), pp. 18–26. ^ California State Assembly. "An act to add section 612 to, and to repeal section 486 of, the Streets and Highways Code, relating to secondary State highways". Fifty-first Session of the Legislature. Statutes of California. State of California. Ch. 426 p. 288, 1480. : "A new route or portion of route is hereby added to the State highway system from Route 165 [Figueroa Street] near Los Angeles River in Los Angeles to Route 161 [Colorado Boulevard] in Pasadena at Broadway Avenue." ^ California State Assembly. "An act to amend sections 251, 308, 340, 344, 351, 352, 361, 368, 369, 374, 377, 404 and 425 of, to add four two sections to be numbered 503, 504, 505 and 506 to, and to repeal sections 603, 611..." Fifty-second Session of the Legislature. Statutes of California. State of California. Ch. 841 p. 2361. : "Route 205 is from Route 165 near Los Angeles River in Los Angeles to Route 161 in Pasadena at Broadway Avenue." ^ Gruen & Lee (1999), pp. 29–34. ^ "By-pass Route Through Elysian Park Tunnels Opened to Automobile Traffic". Los Angeles Times. November 1, 1931. p. E1. ^ "Shaw Opens New Tunnel". Los Angeles Times. August 5, 1936. p. A1. ^ "Street Job Bids Will Be Opened". Los Angeles Times. August 15, 1938. p. A10. ^ Prejza, Paul (donor) (1940). Aerial view of Chavez Ravine in Los Angeles, looking west, ca. 1940 (Photograph). Los Angeles: University of Southern California Libraries Digital Archive. chs-m2270. ^ "New Bridge Dedicated". Los Angeles Times. July 7, 1937. p. A2. ^ "Traffic Project Work Pushed". Los Angeles Times. May 11, 1939. p. A1. ^ Gruen & Lee (1999), pp. 27–28, 53–54. ^ Gruen & Lee (1999), pp. 60, 69. ^ Gruen & Lee (1999), p. 68. ^ Gruen & Lee (1999), pp. 34–51. ^ a b c California Department of Transportation (July 2015). "Log of Bridges on State Highways". Sacramento: California Department of Transportation. ^ Gruen & Lee (1999), pp. 51–55. ^ "New Highway Opens Saturday". Los Angeles Times. July 17, 1940. p. A12. ^ Gruen & Lee (1999), pp. 55–59. ^ Gruen & Lee (1999), pp. 59–64. ^ Rand McNally (1959). Los Angeles and Vicinity (Map). Chicago: Rand McNally. Archived from the original on July 25, 2011. Retrieved July 29, 2011. ^ Gruen & Lee (1999), pp. 64–67. ^ Gruen & Lee (1999), pp. 67–72. ^ Fisher, Jay (August 15, 2008). "Shabby Road: The Ills and Charms of California's First Freeway". The New York Times. Retrieved November 16, 2011. ^ Faigin, Daniel P. "Correspondence between the Division of Highways and American Association of State Highway Officials". California Highways. Archived from the original on June 28, 2011. Retrieved July 29, 2011. ^ California Division of Highways (1944). Los Angeles and Vicinity (Map). Sacramento: California Division of Highways. Archived from the original on July 22, 2011. Retrieved July 29, 2011 – via American Roads. ^ "Route Renumbering" (PDF). California Highways and Public Works. Sacramento: California Department of Public Works. 43 (3/4): 11+. March–April 1964. ISSN 0008-1159. Archived (PDF) from the original on July 24, 2011. Retrieved July 29, 2011. ^ California State Assembly. "An act to amend...the Streets and Highways Code, relating to state highways". 1981–1982 Session of the Legislature. Statutes of California. State of California. Ch. 292 p. 1418. : "Route 110 is from San Pedro to Colorado Boulevard in Pasadena." ^ Gruen & Lee (1999), p. 4. ^ "U.S. Transportation Secretary Mineta Names 36 New National Scenic Byways, All-American Roads" (Press release). U.S. Department of Transportation. June 13, 2002. Retrieved July 29, 2011. ^ Traffic and Vehicle Data Systems Unit (2006). "All Traffic Volumes on CSHS". California Department of Transportation. Archived from the original on July 21, 2011. Retrieved July 29, 2011. ^ Chand, AS (August 26, 2016). "Interstate and State Route 110 Freeway Interchanges" (PDF). California Numbered Exit Uniform System. California Department of Transportation. Retrieved October 21, 2017. Gruen, J. Philip & Lee, Portia (August 1999). Arroyo Seco Parkway (HAER No. CA-265) (PDF). Historic American Engineering Record. Retrieved July 29, 2011. Wikimedia Commons has media related to Arroyo Seco Parkway. Primary Resources—Metro Digital Resources Library: "Arroyo Seco Parkway At 70: The Unusual History Of The “Pasadena Freeway,” California Cycleway & Rare Traffic Plan Images"